We’ve reached the half-way mark of Marvel’s “Phase 2” line of films, which has thus far seen Tony Stark kind-of retire as Iron Man and Thor sort-of abandon his Asgardian duties to live on Earth. Now it’s Captain America’s turn to possibly-maybe develop as a further character before next year’s Avengers sequel. His latest adventure, subtitled The Winter Soldier, is definitely one of the stronger Marvel films as of yet, taking new risks in its expanded storytelling and introducing surprisingly mature themes into the world(s) it has created thus far. Mixing elements from The Avengers and Cap’s first WW2-set solo outing The First Avenger, new directors Anthony and Joe Russo desperately want this film to stay as grounded as possible despite its comic book origins and tone. The Russos, inspired by 70s government conspiracy thrillers such as All The President’s Men – the star of which, Robert Redford, features heavily here as S.H.I.E.L.D operative Alexander Pierce – manage to create a sinister tale of trust and truth with burning questions that keep audiences on the edge of its seat. That is, they do so for at least half of the film. When they insert the required tropes of the superhero genre, that’s when it loses some of its momentum. To clarify, the Russos do “superhero” just fine – the action scenes are solid despite heavy instances of the tired shaky cam motif; some of the fight choreography is impressive when it can be; and passing references to other Marvel characters such as Bruce Banner and Stephen Strange (wink) are fun teasers – but when placed next to the mature thriller it had been developing prior it doesn’t match up so sufficiently. We can’t take suspenseful scenes of Steve Rogers (Chris Evans, still fine despite not-so-interesting hero) and Black Widow (Scarlett Johansson, practically demanding her own spin-off with her awesomeness) evading S.H.I.E.L.D agents in a crowded mall seriously when just a few scenes later we have Toby Jones’s consciousness living on a super-computer and after that see Anthony Mackie’s likable PTSD counsellor Sam Wilson literally fly with (mechanical) wings on his back. This sort of silly contrivance belongs in comic book territory and not one where the aim is to try and keep things as grounded as possible. To be fair, Marvel has never entirely kept its feet on the ground with any of their films – hell, their next film Guardians of the Galaxy, out in August, features a talking raccoon of all things – but when the idea is to make something that should be taken seriously with its shades of conspiracy thriller, it feels very slightly awkward. It doesn’t damage the rest of the film by any means; it’s just a case of mismatched genres. As for the Winter Soldier himself, he’s a formidable threat who creates a tense atmosphere in every scene he’s in – accompanied by a chilling theme by composer Henry Jackman – and as later events show is a good match for Captain America, both physically and emotionally. His true identity shouldn’t be such a shock to fans of the comic, or indeed anyone who can piece together his casting link from the previous film, but that doesn’t stop him from being an adversary we’d like to see more of. Thankfully, the film’s closing moments strongly indicate we haven’t seen the last of him meaning perhaps a further role in future Marvel films. One more notable point: when the film occasionally links back to The First Avenger, it is surprising in how affective it comes across. One all-too-brief scene sees Rogers visit an aged Peggy Carter (Hayley Atwell under some decent make-up work) and their conversation is very heartfelt and genuine that it’s a shame that we never go back to it again in the movie. 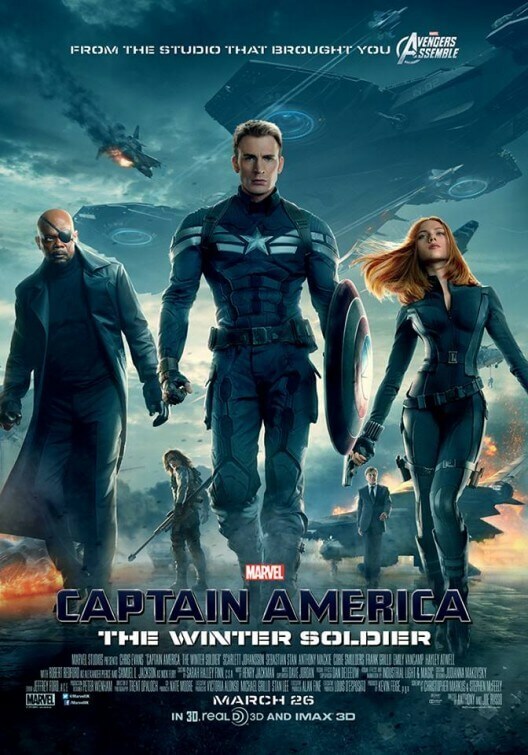 It’s an unfortunate example of how Captain America: The Winter Soldier, like Samuel L. Jackson’s Nick Fury at several moments in this film, has severe trust issues with its own self. 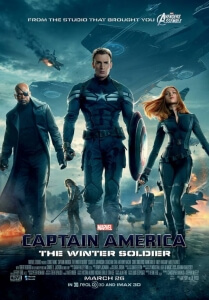 Captain America: The Winter Soldier is solid superhero entertainment with strong action and intriguing political thriller overtones which, while distractingly mismatched with the overall superhero genre, should serve as a filling appetizer before next summer’s main course.